Andrewville is an unincorporated community in Kent County, Delaware. Its elevation is 56 ft (17m) and is located at . It is located west of Farmington on Andrewville Road. 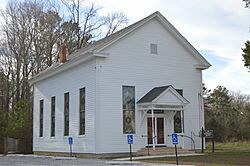 The Bethel Methodist Protestant Church was added to the National Register of Historic Places in 1998. Andrewville, Delaware Facts for Kids. Kiddle Encyclopedia.